Agency responds to claims made by Bus Riders Unite! When TriMet instituted a new ticket system on buses earlier this year – moving from manually-issued receipts to computer-printed tickets – the agency achieved a long-sought after goal: A consistent fare system and 2-hour ticket time across all modes – both buses and trains. 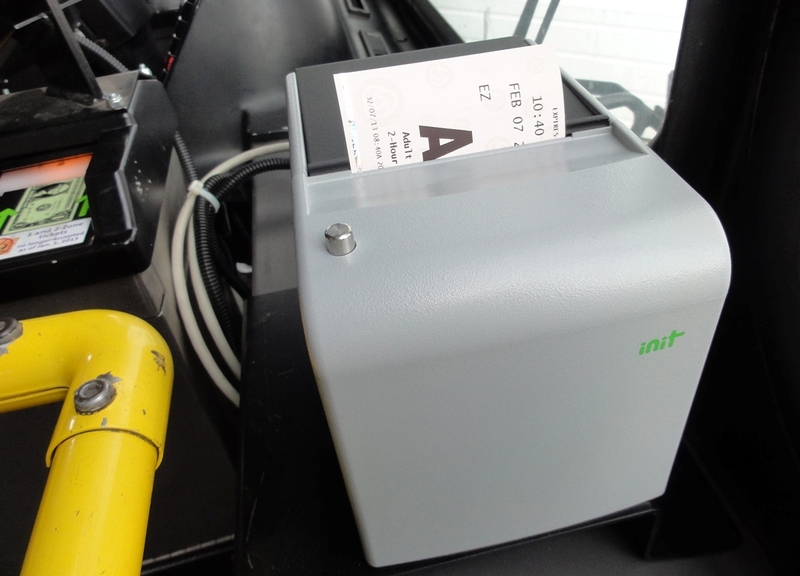 In July, the ticket printers went into use on all buses lines following an initial pilot period on lines 17 and 70. At that time, we emphasized that with the printers, 2-hour tickets on buses would finally be valid for the full two hours. There had always been variability with manual-issued transfers. The tear-off transfers were not precise in showing the valid time of the transfer and some riders got more or less time than the designated two hours. The ticket printer equalized all fares for all riders across all modes. Implementing the bus ticket printers was not a fare hike, rather it was an operational improvement to ensure consistency in the application of our long-standing fare instrument, the 2-hour ticket. For more than a decade, TriMet has positioned the fare structure to consist of a monthly pass, a day pass and a 2-hour ticket. While the 2-hour ticket has always been exact on the MAX system, the time on buses was not due to the manual process of punching and ripping the tickets, and we were criticized for the discrepancy. When we introduced the ticket printers, we solved the inconsistency. The 2-hour ticket is intended to allow a rider to make a one-way trip to their destination in that two hour window. If riders travel shorter distances, they can make a round-trip on the single fare. With the 2-hour tickets on both bus and MAX, riders only need to board the vehicle while the transfer is valid; they do not have to complete their trip during the 2-hour ticket window, just as in the past when riding with a manually issued transfer. We have heard that some riders believe they have to deboard when the 2-hour ticket expires. That is not the case. You just need to board the vehicle before the time expires. TriMet is committed to providing high-quality service to low-income communities and communities of color. In addition to our existing reduced fares for seniors, youth and people with disabilities, we set aside $1.3 million for our low-income fare discount programs, Access Transit. In coordination with Ride Connection, TriMet has distributed $335,691 in grant funds to 33 organizations in all three counties TriMet serves. The program is part of an effort to mitigate the impact of the 2012 fare increase. Anyone interested in the Access Transit program or wanting more information should go to trimet.org/accesstransit. In April 2012, TriMet conducted a Title VI equity analysis of proposed fare changes: TriMet Title VI/Transit Equity Impacts Assessment – Recommended Plan for Major Service Changes and Fare Changes; Effective September 2012. The analysis assessed proposed fare changes for any possible disparities in regard to adverse effects on minority and low-income riders, and highlighted a number of actions to mitigate any such impacts.